So technically, I know this is not a true frittata, but because it is crustless, I am reluctant to call it quiche, but that's essentially what it is...without a crust. I love quiche, but the crust is not part of low-carb living, so when I found a frittata recipe years ago, I started making my own version. I always make at least two, so I'll give the recipe for two. I first saute about half a medium chopped onion in a skillet with butter. I add chopped bell peppers sometimes too. I add the onions to the bottom of both dishes. Depending on what veggies I use, I steam them as I saute the onions. I usually use whatever is left over, though. You can also add cooked sausage, chopped ham, etc. I then sprinkle about a cup of cheese--could be cheddar, mozzarella, swiss, monterey jack, a mix of several, etc. , on top of the fillings in each dish. I beat up 10 eggs and add about a 1/2 cup of cream plus salt and pepper. Pour this mixture over the veggies/cheese, etc., in both dishes. I kind of shake the dishes to make sure the liiquid is distributed evenly. Bake in a 375 oven for about 40 minutes, or until done. It all depends on the fillings you have, your oven and how deep your dish is. It varies for me, but I start checking about the 35 minute point. I also like to add tomatoes, roasted peppers, parmesan cheese, etc., to the tops at the end. We love these and I make so many different combinations that everyone here has a favorite. It's a great way to use leftovers and get veggies into everyone. 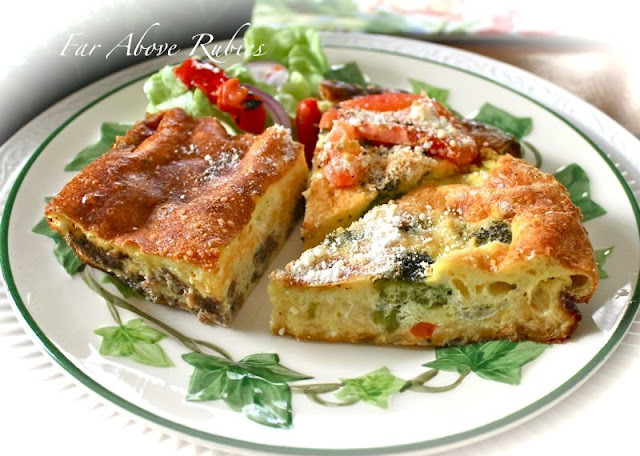 YUM -- I LOVE frittata and it makes a wonderful low-carb meal - breakfast, brunch, lunch or dinner!! Gail, that is a good point! We will often have them for dinner then the leftovers for breakfast and lunch. We are huge fans of the frittata :-) Makes a fab meal anytime! Light enough yet filling. About the cooking spray. I use a spray bottle and olive oil. Been decades since I bought Pam :-/ Give it a try. You'll never buy Pam again. Yum! I have all the ingredients for this. Maybe I'll make it tonight for dinner! It is pretty similar to my recipe, but it never occurred to me to just make it with out the crust. I had to admit my ignorance, but I've never heard of frittatas. Since my hubby doesn't care for anything with a crust, I'm definitely going to try it--and probably for breakfast!